▪️I'm excited to be part of this interview by Henrietta Biayema for Montgomery Municipal Cable TV Channel 16, about Wheaton Arts Parade Gallery and the upcoming event in September 22, 2019. The interview includes WAP's founder, Dan Thompson, artist Nar Steel and me. 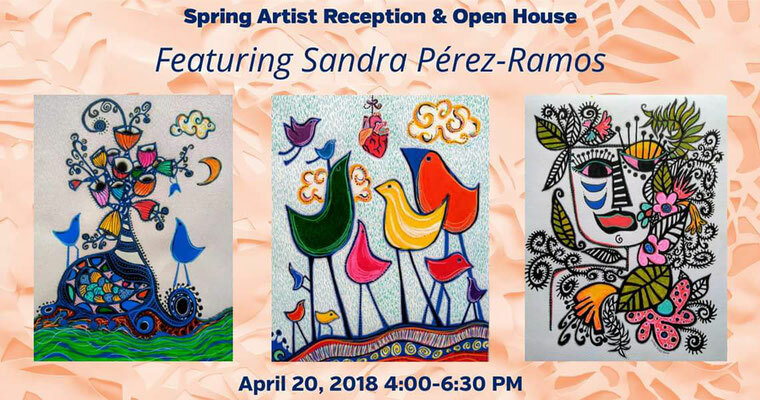 ▪️The April Show at Wheaton Arts Parade Gallery is up and running with more artists this month. I am showing 5 originals. Visit us during gallery hours! M-TH 11am-8pm, Fri-Sat 11am-9pm, Sun 11am-7pm. ▪️A new show is up at Wheaton Arts Parade Gallery on the 2nd level of Westfield Wheaton Mall. We are now 21 local artists!! This month, I'm exhibiting 4 originals (and new prints are in the bins). The show runs through the end of March 2019. ▪️GAITHERSBURG ARTIST COLLECTIVE'S "ART FROM THE HEART SHOW" AT ARTISTS ON MARKET. 201 Market St, Gaithersburg, MD. Opening reception: 1/27/19 from 2-5pm. Show runs through end of February. I have 6 originals exhibiting here, also miniatures, cards and prints for sale. 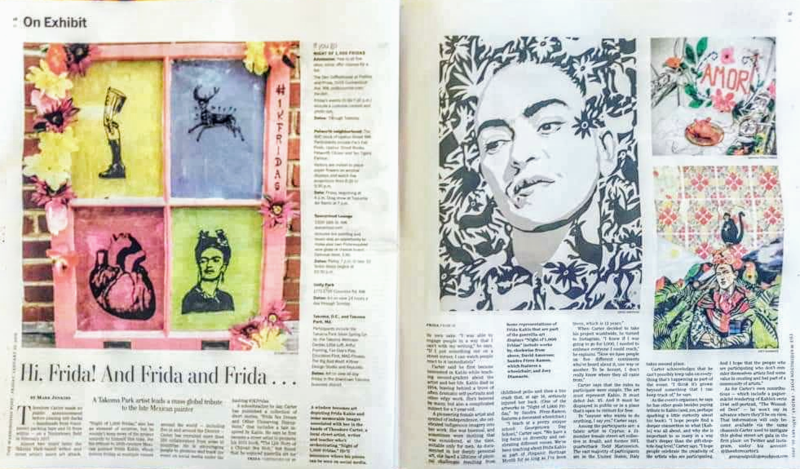 ▪️My art installation "Amor y Dolor/Frida's Wheelchair" was featured on both, 4 NBC WASHINGTON, and on WASHINGTON POST in an article about Night of 1000 Fridas public art event by Theodore Carter. It was displayed at Wheaton Arts Parade Gallery on the night of #1KFRIDAS 1/25/19 and exhibited to the public at Westfield Wheaton Mall. ▪️WHEATON ARTS PARADE GALLERY INAUGURAL SHOW in Westfield Wheaton Mall (11160 Veirs Mill Rd/20904). 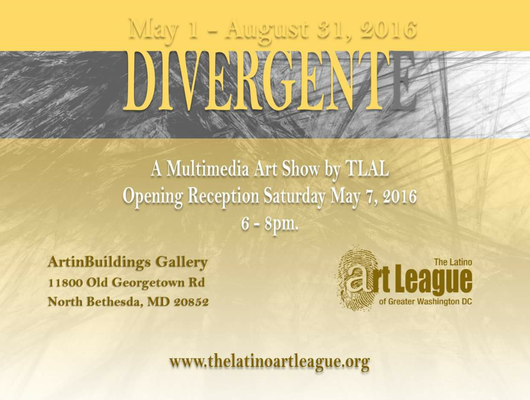 Five of my originals are exhibiting here. This pop-up gallery is located on the 2nd level of the mall, across from Kay Jewelers. It opened on 1/18/19, includes local artists and photographers, the show runs through the end of February. 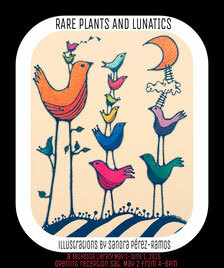 Cards, prints, art jewelry for sale too. Hours are Sun-Thurs11am-7pm and 11am-9pm Fri-Sat. You're invited to the OPENING RECEPTION on February 9, 2019. Save the date!! GAITHERSBURG ARTISTS COLLECTIVE'S DECEMBER SHOW AT ARTISTS ON MARKET, 201 W Market St, Gaithersburg, MD. Opening reception: Dec 2, 2018 from 2-5pm. INSPIRED BY FRIDA AT ARTISTS & MAKERS STUDIOS 2 at 12276 Wilkins Ave, Rockville, MD. Opening reception and Holiday market on Dec 7, 2018 from 6-9pm. Closing reception and market on Dec 22 from 10am-4 pm. My installation "Amor Y Dolor/Frida's Wheelchair" is exhibited here. GAITHERSBURG ARTISTS COLLECTIVE'S OCTOBER SHOW AT ARTISTS ON MARKET, located at 201 Market St West in the Kentlands area of Gaithersburg, MD. Hours are Fri 4-8pm, Sat-Sun 12-8pm. 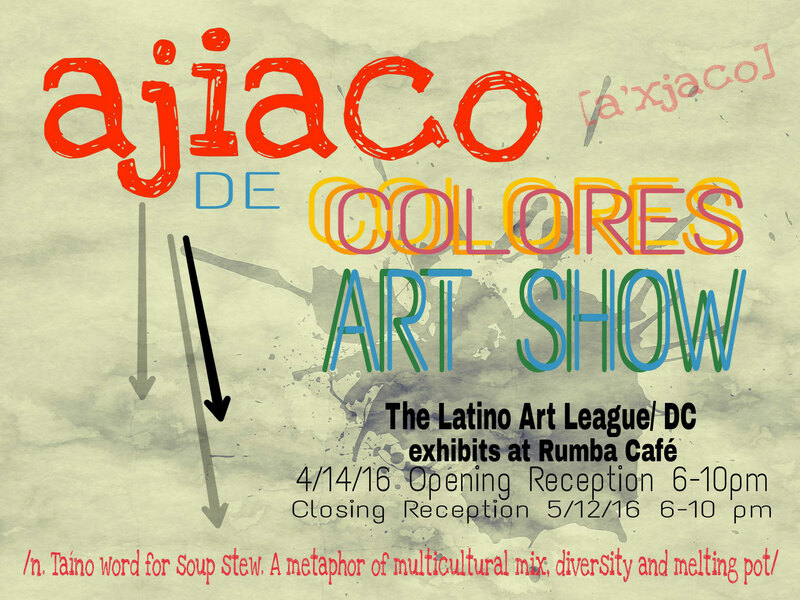 "NUESTRAS RAICES LATINAS"/OUR LATIN ROOTS ART SHOW". 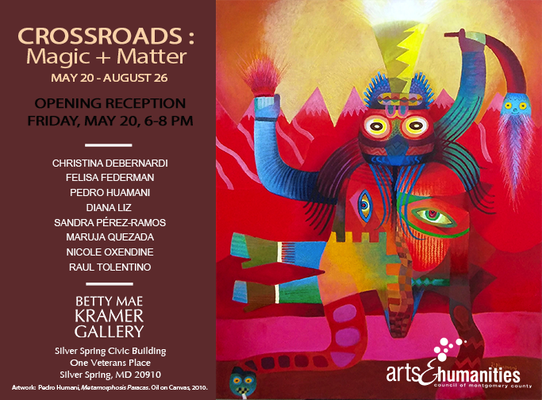 My work is part of this exhibition by invitation from MNCPPC of PG County, during Hispanic Heritage Month Celebration. A reception will be held from 2-4 pm on 9/15/18 at Publick Playhouse in Cheverly, MD. The show runs through November 10, 2018. MASTER ARTISTS TABLEAU VIVANT @ Wheaton Arts Parade, in MD. I've organized a group of 19 diverse, local artists to impersonate different iconic painters and pose as living pictures during the parade. 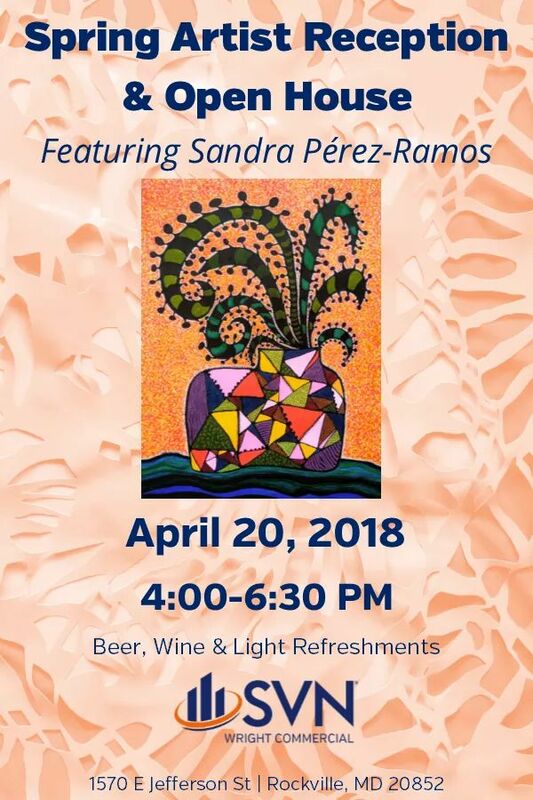 We will represent Montgomery Art Association and Latinx visual artists in the area. You're invited! My artwork "Wander", (mixed media: pigment inks and gouache pen) is now exhibiting at OASIS GALLERY inside Macy's Home at Montgomery Mall in Bethesda, MD through May 4, 2018. A free, opening reception will be held on Saturday, March 17 from 2 - 3:30pm. 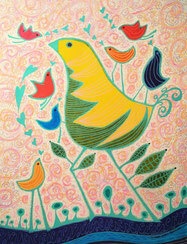 The show includes works by 26 artist members of Montgomery Art Association. Save the date! My solo show "Textiles and Lunatics: Constructing Dreams" at the Merge Gallery in Artists and Makers Studios 2, opens this Friday December 1rst from 6-9pm. What is special to you? It could be something, someone, a concept, dogma, romance. Desde la vida cotidiana...hasta algo espectacular. Like our grandparents' kitsch, old fashioned sofas or like religious scapulars... contained in clear plastic vinyl or singled out in niches, encased, preserved in time. In this show, I explore what is sacred, those dreams that are never abandoned. Those longed for but never reached, those that were completely lost, others that were found. The dreamers, (creative types) are usually considered mad, idealists, lunatics...who wonder, persevere, do not abandon their beliefs. "De poetas y locos...todos tenemos un poco". 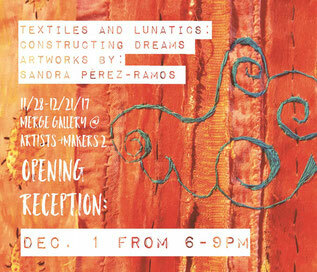 Opening on Friday, December 1, from 6-9 pm at the opening reception of my solo show "Textiles and Lunatics: Constructing Dreams". There are lots of new, experimental fiber artworks, fun illustrations and an interesting combination of media in this show! It runs through December 21 at the Merge Gallery in A & M 2 (12276 Wilkins Ave. Rockville, MD 20852). Gallery hours are Tues-Sat 10 am- 4pm. 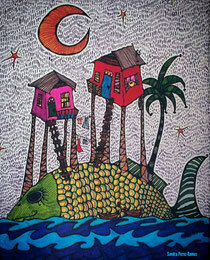 For more details of my show, please click on link to DC Art News blog! 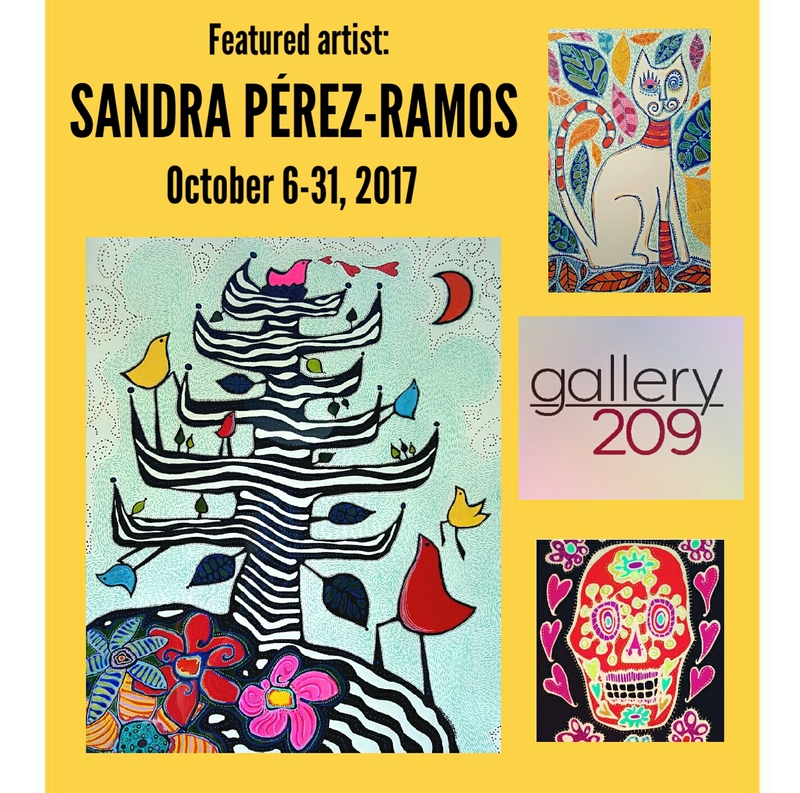 October Show/Featured Artist at Gallery 209/ A&M 2. October 6- 31, 2017. Opening reception: October 6 from 6-9 pm. My art will be featured this month! (75% of sales of my art will be donated to a Puerto Rico hurricane relief fund of the customer's choice). We are 12 contemporary, local artists partnered in Gallery 209 @ Artists & Makers 2 (#12276 Wilkins Ave. Rockville, MD 20852). We work in different media and styles ranging from abstract to representational. There's a new show every month with opening receptions held every first Friday of the month. We welcome you to our gallery. Hours: Tues- Sat 10 am- 4pm. More info at: www.gallery209art.com, www.facebook.com/gallery209art and on Instagram @gallery209art. Here's the link to his blog and short story, added on September 27, 2017. Wheaton Arts Parade 2017 was a success! 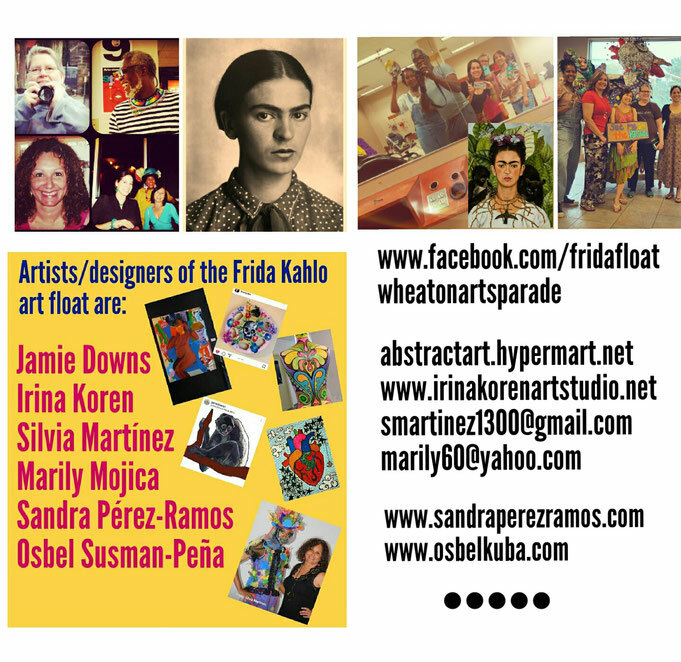 I was part of a team 6 artists and designers, winners of a WAP grant and we built a beautiful float "Celebrating Frida Kahlo". We marched to celebrate art and diverse cultures in the Wheaton area with our float. Friends, family and more artists joined us dressed as different Fridas and Calaveras. There were also other awesome floats built by local artists and students. A festival followed, with 3 stages, music performances, puppets, films, poetry readings, tents with children's crafts, art for sale, and food vendors...all by LOCAL talent and businesses. I'm looking forward to participating next year!!. 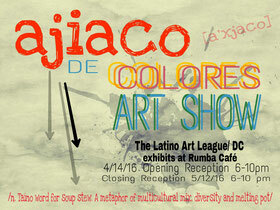 Ajiaco de Colores Art Show- Members of The Latino Art League of Greater Washington, DC exhibit at Rumba Café. 4/14-5/12/16. My work (top, right) featured on the Washington Post Jan/2019. #1KFRIDAS PUBLIC ART EVENT by Theodore Carter. My installation piece "Amor y Dolor/Frida's Wheelchair" was featured on NBC Washington, and on the Washington Post. It was displayed at Wheaton Arts Parade Gallery on the Night of 1,000 Fridas (1/25/19) and exhibited to the public at Westfield Wheaton Mall from 6-8pm.